As some of you know, I came to blogging via a convex route: aka my companion Remi telling me that, as my career as a travel writer had been put on hold, I had to start doing something creative as an outlet because my restlessness was driving him crazy. He suggested that I start a blog. This blog, actually. But at the time, blogs were still...questionably legitimate. Coming from the background of already being a professional journalist, I puffed up as a snob. That is until I started looking further into what they were. 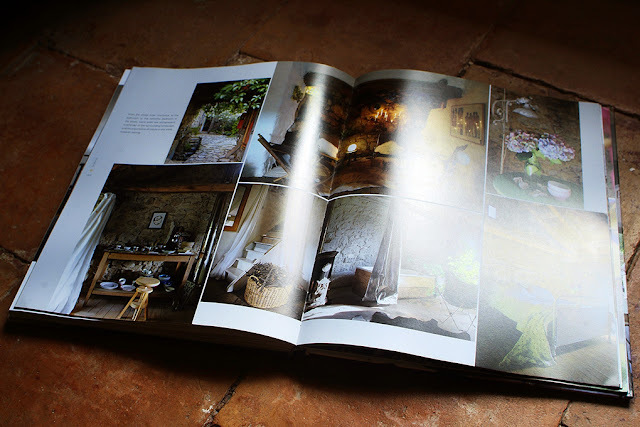 The very first blog that I found which clicked with me was My French Country Home. As soon as I began delving into the fine phrasing and poring over all of the lush, original photography, I quickly changed my tune to, "Oh my goodness, I can't do this!" Finally, I decided to stop reading it for a while until I found my own voice, my own way of doing things. Interestingly enough, today I am really grateful to call Sharon Santoni, who is the blog's author, a friend - albeit one that I haven't met yet in person, as hard as that is to remember sometimes. She is an amazing woman - smart as a whip, thoughtful, romantic yet driven, extremely generous in her support, incredibly funny and has pitch-perfect taste. 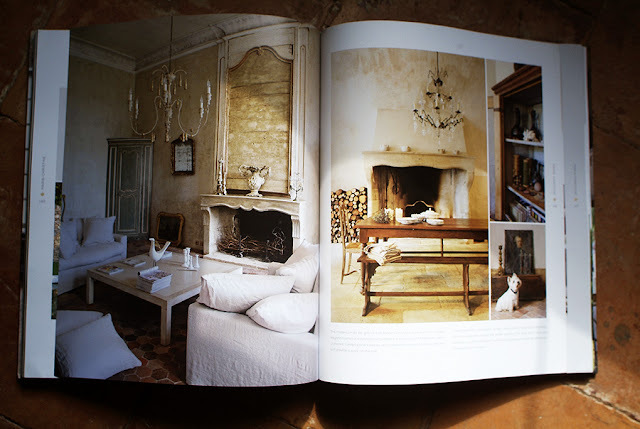 My French Country Home only continues to grow and accrue enormous success with thousands of readers all around the world. And she deserves every bit of it as she is an unbelievably hard-worker who has persistently pushes herself and her aesthetic at a non-stop pace...all while making it appear...effortless. Eh, oui. C'est ça l'histoire. And it something that she has very much in common with the subjects of her new book, "My Stylish French Girlfriends." Now, listen. I am as over the deification of the French woman as the next person. I know plenty of seriously hot messes here in Provence and remember thinking when I first moved to Paris fourteen years ago that, "New Yorkers dress better than les Parisiennes! Ha!" But...but...I have to admit that when the French woman gets it right...she nails it. Because for her, it goes far beyond appearance to constructing an interesting and interested full life, one that often has been settled on her own terms too. Does money help in this process? Well, of course it can. And I will admit (with embarrassment) that when Sharon first told me about this project I had a wee apprehension of "Will this only be about wealthy women who have access to everything?" shimmy over me but of course I should have given my friend more credit than that (sorry!) for she was determined to present twenty women of all age ranges with varied careers and economic statuses who live throughout this glorious hexagone called France. The common thread that unites them is that they are not in search of perfection (an evil, poisonous word if ever there was one) but of authenticity by making specific choices to build a life true to their spirit and dreams. We are first introduced to Alicia, a charming young redhead (a-hem) who left school at the age of fifteen to join a circus and now is a gifted stylist and brocanteuse. Several chapters later, we meet Evelyne, une femme d'un certain age, who, as the fifth generation to run Boizel, her family's champagne vineyard, is searching for new resources to keep their bubbly relevant in this digital age. Amongst the women there are quite a few designers and decorators of varying tastes, as well as artists, antique dealers and business women with quite different lifestyles. Through the gorgeous photography by Franck Schmitt, we are invited into the personal spaces that they share with their loved ones, creating an ambiance as intimate as the stories that Sharon reveals about each of her girlfriends. I know her writing well and her naturally calming cadence perfectly compliments Franck's use of depth of field to softly guide the eye. Is the result quite glamorous? Yes, delightfully so but also grounded and real. The women do not appear to be overly made-up for the camera and Sharon states that the homes were not styled beyond the addition of fresh flowers. For me, that makes it especially appealing. Finely printed, it is a beautiful book. Another aspect that Sharon fought hard for during its inception was its size. It is big but not too much, just perfect to balance on one's knees and yet not so small as to be shuffled away on a bookshelf...ça serait dommage. I was given "My Stylish French Girlfriends" as a birthday gift from another wonderful friend, La Contessa. That was in August, so why am I only sharing it with you now? Well, I wanted to savor it. Rather than read it all at one go, I would sit down on the terrace in the end of summer light with a glass of wine and read a chapter, maybe two. It was enough to give me quite a lot to think about or swoon over, both equally important. 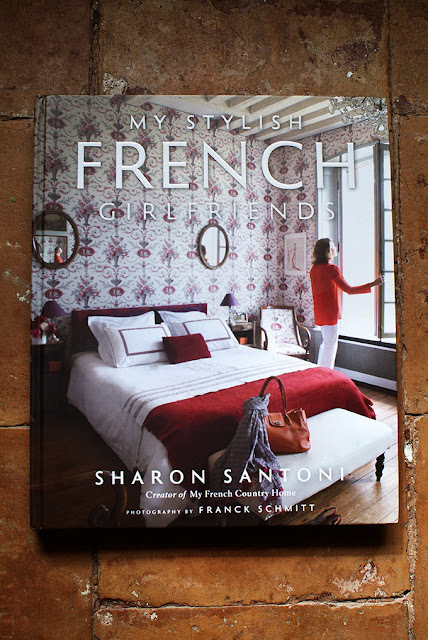 And I still go back to simmer over the images and the text because in creating "My Stylish French Girlfriends" Sharon Santoni has given us a wonderful resource to something that all of these women exude...inspiration. To buy "My Stylish French Girlfriends" in the US through Amazon, click: here. To buy it directly through her publisher, Gibbs Smith, click: here. Pour l'acheter en France, cliquez: ici. While there is a Kindle edition, I really think that the hardbound is best in this case. Her online brocante shop can be found: here. For more information about her brocante and lifestyle tours, click: here. And to inquire about staying at her guest cottage, click: here. See? I told you that she is a hard-worker! Sharon has no idea that I am doing this post today. But this month's By Invitation Only topic - which reunites a group of bloggers around the globe to discuss a pre-determined theme - reintroduced last October's question of, "What is the one thing that you can't live without this Fall?" and I immediately thought, "inspiration" which lead me pronto to Sharon's book. I know that quite a few of you already know and love it but for those of you who don't, well, I hope that you enjoy "My French Stylish Girlfriends" as much as I do. Brava, Sharon! To discover what the other bloggers have cooked up for this months theme, please visit: here. I have to admit I was tempted to binge read it...but I savoured it slowly and have it on my coffee table in the living room of our humble bungalow so that I can pick it up easily and peruse it at my leisure. Mine is here on the trunk in my office, right by my big comfy chair. BEN and THE BIRTHDAY BOOK!!!!!!!!! SO, delighted YOU LOVED IT and devoured it! Yes, INSPIRATION is what WE ALL NEED on a daily dose.I was so happy to hear that CARLA and SHARON spent the weekend together in FLORENCE!My old stomping grounds..........I really need to go back.........talk about INSPIRATION!!! Hugs to you and your new BICYCLE!DO we have a name for HER?? YOU MUST COME UP WITH A NAME...............thats an ORDER!!! I will send you the photo before I forget - it is the least that I can do to say thank you! And how funny that we both mentioned each other in our posts today...I love that. Yes to Florence! Any time you want! If I can in any way afford it, I would be there along with you too. I've read Sharon's blog almost since the beginning, I think. 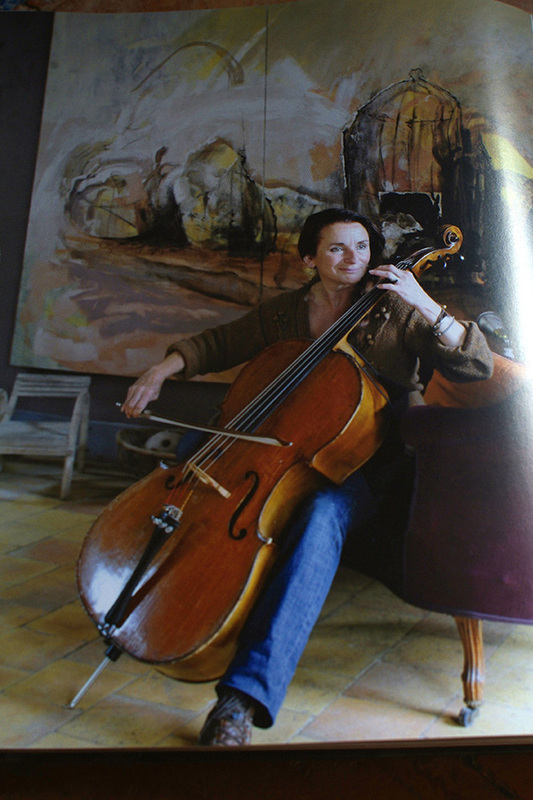 Her distillation of French country life is wonderful. I have looked at the book on line and it's on my wish list. Thanks for this endorsement! It would make a wonderful Holiday present for you, Lorrie! It certainly was a great birthday gift for me, I love it. And I think I have been reading for nearly the whole time too. Sharon is so talented, it is amazing. I can barely crank out a post once a week these days and yet she hits six or seven all these years without fail AND they are fantastic. It looks like a wonderful book! I love that the women featured are not after perfection (ptooey!) but are living authentic lifestyles pursuing things they love. Kind of reminds me of my stylish French sister, who I think would also write/photograph an amazing book that we would all like to see! Talk about inspiring!! And anything that Ben recommends, I would approve of - he is a trendsetter! You know that I am fairly new to Sharon's blog, and have no history with her as you do. But... but... but... You also know that I couldn't agree with you more, that I have her book and do indeed savor it (though I gobbled it down first over a weekend), and she has done such a beautiful and nuanced job of capturing a certain "je ne sais quoi" that I believe You (chère amie) described well in saying that French women go "far beyond appearance to constructing an interesting and interested full life." You have chosen a marvelous "must-have" for fall, and done Sharon's elegant and delicious book justice. Brava to you, to Sharon, and to Ben as well for his thumbs up... make that, paws up! okay. you've convinced me. you and ben. Jackie, you of all people should see through a dog's whiling ways!! How incredibly wonderful this is, Heather. Of course, you spotlighted someone else and their wonderful book. I pre-ordered a few for my girlfriend's Christmas gifts, and now I'm finding it so hard not to pass them out as soon as I see them. Yes, a beautiful book indeed. Thank you, especially, for the pic of Ben. You know how I love those dogs of yours. So happy you are with our group !!!! Oh I know I would be tempted to give away any copies in my hot little hands too!! This is the best review of her book I have read and it delights me realize I now must get it! Ah yes, the quest for perfection is the enemy of joy. I've seen some hot messes in France too. They exist everywhere. Hopping over to order a copy right now! Jennifer, if you get a chance, pop over to Daily Plate of Crazy's review (the last link above) - it is excellent! Brilliant Heather ........ such a great take on our subject this month. 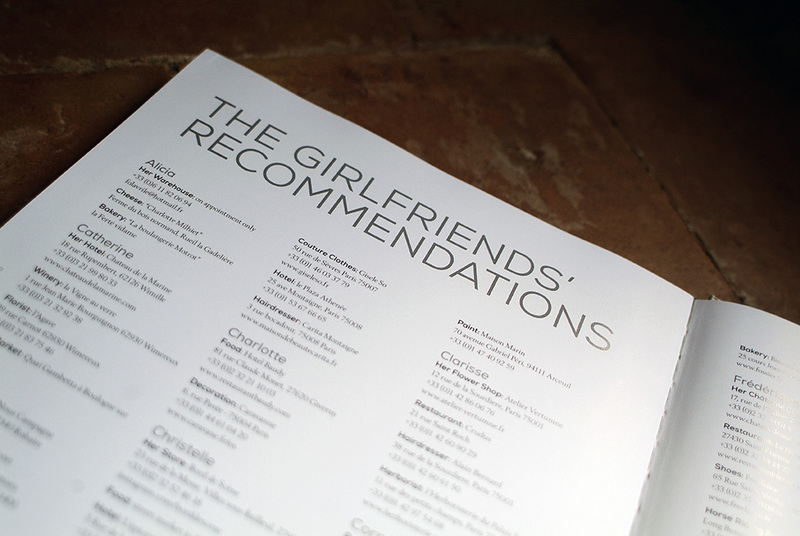 Bravo Heather, thanks for highlighting a book about "real" women and real friends. Heather, I received her book in August also. Love it....I even wrote a review for Amazon. I've never done that before. Oh boy! Heather! thank you so much for this very generous and heartfelt review of my book! I am honored to have clever girls like you saying such nice things about it - grazie mille! I had to say that bit in Italian because I am still in Florence with only intermittent internet which is why it's taken me all day to get here. I am SO happy (and a bit relieved) that you enjoyed it! It was really, really fun to write but I had to put quite a bit of thought and care into it as I really wanted to do your baby justice. Enjoy your time in Florence!! 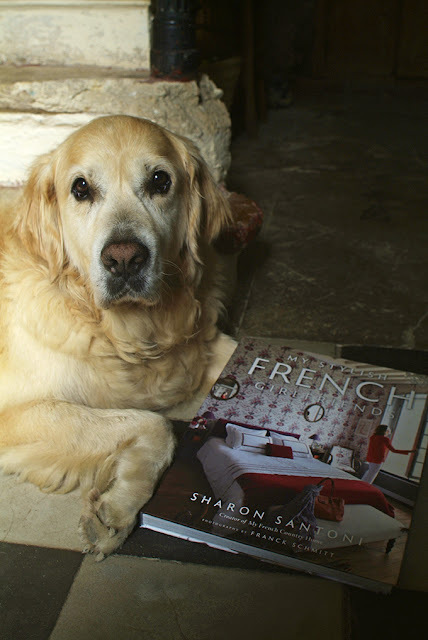 Ben makes a good case for anyone to buy and read Sharon's book...we had a Golden for years and they are very wise dogs!!! Love your review Heather. They most certainly are! As my Sister wrote above, Ben is a trend-setter!! The other books that he has approved? Let's see..."Mastering the Art of French Eating" by Ann Mah..."Forever Chic" by Tish Jett..."How to Stay Sane in a Crazy World" by Sophia Stuart...all smashing successes! I am so looking forward to this book! And you are right to say that money helps, but is not the only criteria for style. One of the most stylish women I know is a friend in France, with absolutely no money what so ever. She and her partner are rebuilding an abandoned village (the WHOLE VILLAGE, and soon the abandoned castle next door) on a hill top near the Pyrenees. They live incredibly simply in the lower village with their two sons, and during the summer and some of the fall, they move up to the the village on the hilltop and work on the project along with dedicated volunteers. Everything Estelle does appears effortless, from what she wears (always perfection) to preparing a meal (she is a graceful blur in her kitchen..with no running water) for the 15 or so volunteers who help out during the 2 week sessions. I am in awe of her beauty and composure. She is (one of ) MY stylish French Girlfriends! Was given this book a month ago. At first I thought - another French style book. Not so, This book is nicely done. I purposely didn't devour it immediately. Am savoring it & liking it. And, I do agree money does help but taste & creativity also adds much to living an interesting life. Rosie, it is the line of creativity that spark through these women that interests me especially, I completely agree with you! Your review captures the essence of this book beautifully! I gasped when I opened the cover; the images are just that lovely and inviting. I agree Karena and I absolutely feel the same. I am so grateful that you found me here and have stuck around these years! I think that you are one of the longest standing readers (that isn't family :) that I have. Inspiration, one of the gifts from the gods. "But...but...I have to admit that when the French woman gets it right...she nails it. Because for her, it goes far beyond appearance to constructing an interesting and interested full life… ... they are not in search of perfection...but of authenticity"
With these words you made the book irresistible for me not to read. Well, it is what I quite appreciated in these women and I am glad that you enjoyed that description. It is a lovely book. Mrs. Abstract might enjoy it too. Oh I hope that it was more wonderful than challenging and that you were able to spend some good quality time with your son! Speaking of NYC, I miss their library system terribly. I couldn't afford books for most of the years that I lived there (well, at not regularly enough to keep me happy) and so the library totally saved me. I was just talking about the three volumes of John Richardson's biography of Picasso - that is a perfect example of something that I would never have been able to have read otherwise. Gorgeous review - beautifully written, so clear, and honestly 'praiseful' of Sharon's book. I, too, love to read Sharon's blog, and I am always amazed at how much she experiences, accomplishes, with such ease. I just may need to treat myself with this beautiful, insightful book when I get to my daughter's house. Then we can share the beauty and wisdom of these accomplished, fully alive women. It definitely changes one's mind, I have to say. It isn't even that I love every single woman's tastes either but just the way that Sharon shared them with us as a whole that is gorgeous. Thank you for your kind words about my review. Aloha Heather .. a book review "from the heart" .. hence your own success. Bravo! Mahalo et Merci for being you.